The valued members of our association help support our efforts to preserve, promote, educate and enjoy Route 66 in Illinois. We welcome you to join us in this noble cause. Membership in our Association places you among those dedicated folks who are willing to put some of their hard-earned dollars toward safekeeping the American treasure that is Route 66. We are a volunteer organization – proceeds from membership dues are responsibly allocated to fund projects for the upkeep and promotion of the Mother Road. We greatly appreciate each and every one of our members! Please take a look at our membership options and choose the way you’d like to support The Route 66 Association of Illinois! Thanks in advance! See you on the Road! You may pay online (simply click the Pay Now button below) to join our Association or to renew your membership. To pay by mail, see instructions below Membership Options. 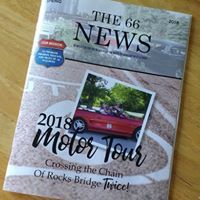 All members receive our quarterly, members-only newsletter, The 66 News. *Lifetime memberships are no longer available. Memberships run for a complete year from your join date.